Do you trade with a channel? There are dozens of channel for trading including linear regression channel, moving average channel, and trend line channel. Regardless of your favorite channel tool, there are 4 ways to trade them. Let’s learn about them to make the most out of your trading channel. This is a trend trading strategy. To use this trading method, you must have a channel that is sloping at a healthy angle to confirm that the market is trending. A trend line channel is the perfect tool for this trading method. Let’s go through this channel trading example. We drew a trend line with two swing highs. The trend line was sloping downwards. Then, we drew a parallel line starting with the swing low to complete the channel. Prices went up to test the trend line, which is also at the level of a previous congestion area. Hence, the context was excellent for a bear trade, so we went short with the bearish inside bar. The channel trend line provided the perfect price target for this trend trade. We could have taken the short trade using only the trend line. However, having the channel gave us a clear exit point for this trade. To learn more about trading trends with trend line channels, read Channel Surfing: Riding the Waves of Channels to Profitable Trading . When price exceeds the channel trend line, it could be a climatic move, implying that the trend has exhausted itself. We can then look out for reversal trades like the one below. Reversal trades are usually low probability trades so we must select only the best trades. Follow these rules to find the best reversal trades. Ensure that the channel is going against the trend of the higher time-frame. Effectively, you are looking for a retracement of a larger, more powerful trend. Trade reversals with steep channels. Steep channels are unsustainable. Channels are not just for trending markets. They are also useful in highlighting range-bound trades. In horizontal channels, we can trade without directional bias. We can sell short at the top of the channel and buy at the bottom. The Gimmee bar trading setup is an example of trading ranges with channels. However, in the Gimmee bar strategy, the Bollinger Bands acted as the channel. 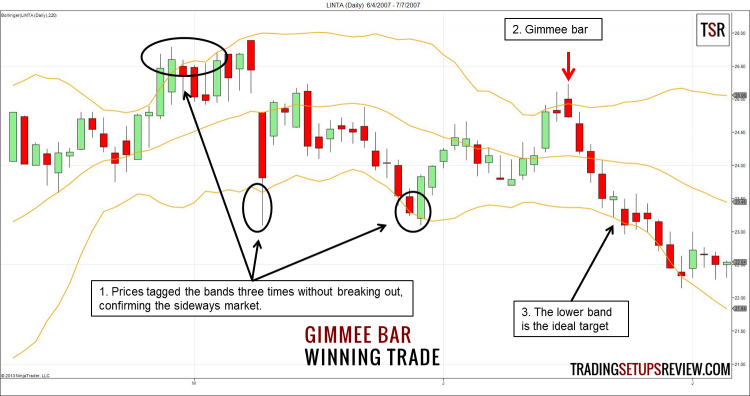 Read our review of the Gimmee bar trading setup to learn more. The earlier strategies assume that the channel will contain price action and seek to buy low, sell high. What if this assumption fail? Then, we might have a break-out trading setup that often offers quick profits. However, judging which break-outs are valid is an art that is hard to master. Pay attention to volume. Valid breakouts are strong with increased volume. 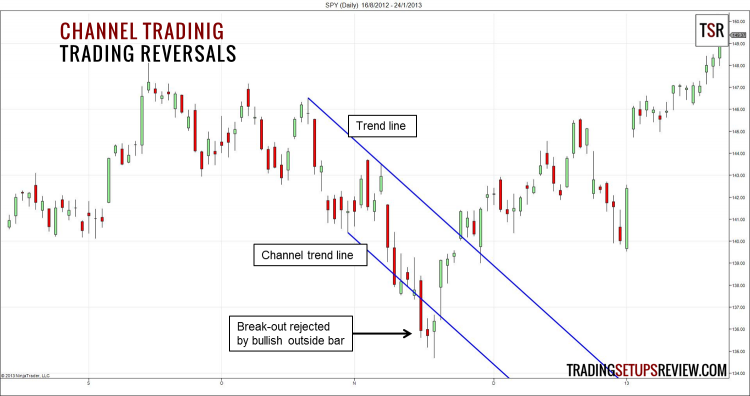 Quick Trade using Linear Regression Channel – A classic example of a break-out trade. 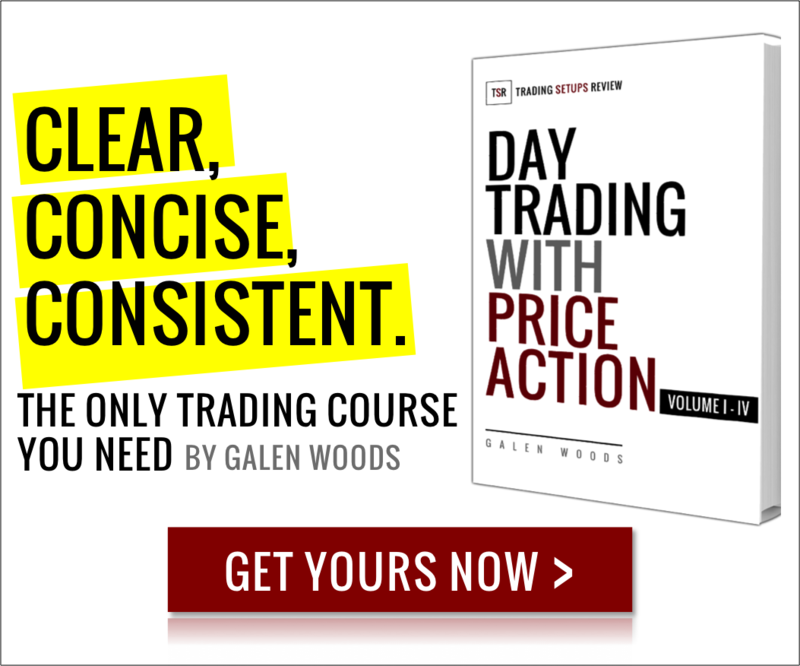 A Simple Day Trading Strategy – It uses MACD to confirm the breakout of Bollinger Bands. 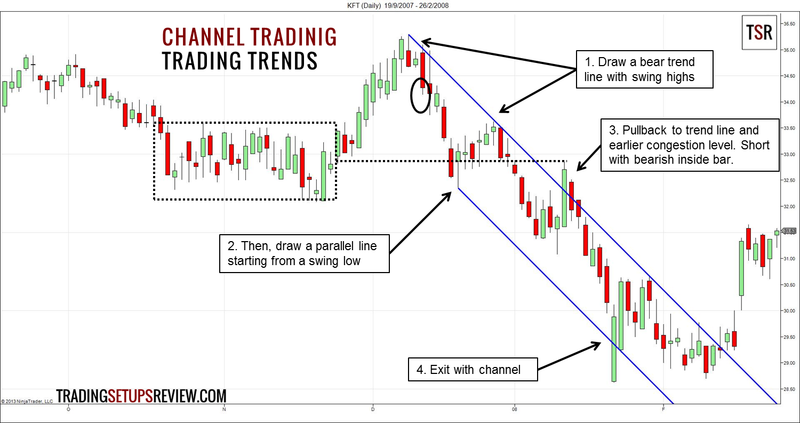 Channels are powerful trading tools that highlight trading opportunities for all 4 types of basic trade setups. However, for some traders, having too much trading options is a drawback. They look for trading setups everywhere. They take a retracement trade, and then a reversal trade, and then think that a break-out is impending. All these within a few minutes. They are overtrading. A solution is to draw a larger channel to analyze the larger price context and only take trades in its direction. For indicator-type channels, you can increase both the look-back period setting and the deviation setting to create a larger channel to contain long-term price action.